I feel sorry for those who are complaining about BUBBLEWS. I am with you guys because it also happened to me. I haven't received my first redemption and I know how it feels. I started bubbling last November 2012, that time I am still in doubt with BUBBLEWS(see story here). 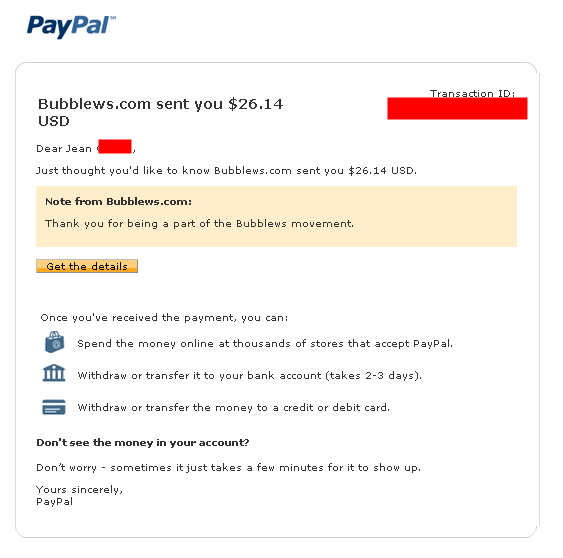 Even if I am a bit skeptical with the movement; I did not complain and I don't contact BUBBLEWS regarding my FIRST REDEMPTION. I continue writing and posting articles in different categories they have, and to think positive that maybe somehow they will notice my writings. PATIENCE with TRIALS and HARDSHIP really pays. And I agree, after 1 month I made my 3rd redemption from BUBBLEWS. Yesterday morning of January 30 I REDEEM my $26.14 USD. Then before the day's end, Paypal sends me email confirming that BUBBLEWS sent me money. So that's it, I have my money now on my Paypal. Isn't it GREAT? Thanks so much BUBBLEWS and I am happy to be part of your movement too. Make it sure when you do your comment exchange syndication make it relevant and appropriate. And most of all RESPECT OTHERS POST. Respect is very important. Good thing you were able to redeem the paypal money you're expecting. Nice ! Glad they paid you ! 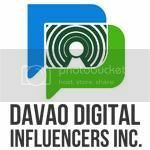 i experience for i haven't receive my first payment but now i continue to bubblews and make a post .. i will try to redeem again .. :D thanks for the info ..